For high-speed sailing look no further than going for a blast on a Catamaran. Our Beach Club holiday guests have inclusive access to the dinghies and catamarans throughout their stay. We also provide free group tuition sessions, which cover everything from basic skills to the more advanced techniques. Once you’ve attended our compulsory Safety Briefing at the beginning of the week feel free to hop on a cat and go for a blast. If you’re already a competent dinghy sailor just make your way down to the beach and our friendly team of instructors will rig and prepare the catamaran for you. Whenever there are boats on the water, our safety team are out on patrol in the rescue craft. Help, casual tuition and friendly support are always available. We are delighted to offer free beginner sessions to all our guests staying at the beach club. Throughout the week, we’ll help you to progress by improving your technical knowledge and practical skills on the water. Inclusive group sessions take place most days, just check the beach info boards for further details. After some fun land drills and a safety brief, novice sailors will quickly get to grips with the simple controls on a cat. We also offer intermediate sessions for those looking to get to grips with catamaran sailing. 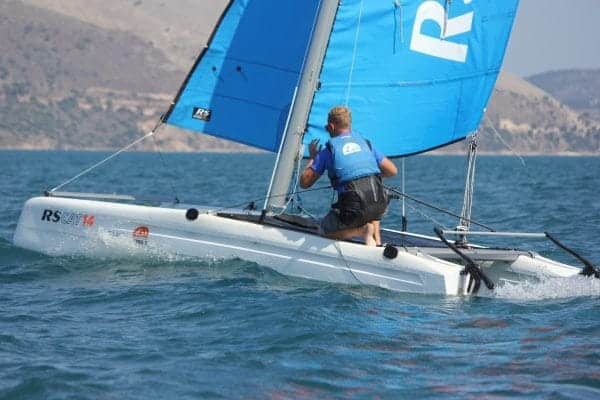 Our instructors take you through the basics of handling the Cat and will quickly progress towards more skilled techniques in moderate winds. If you can confidently execute all the basics of sailing, including tacking and gybing and sailing a triangular course, our instructors will aim to get you comfortable and confident sailing in moderate winds. 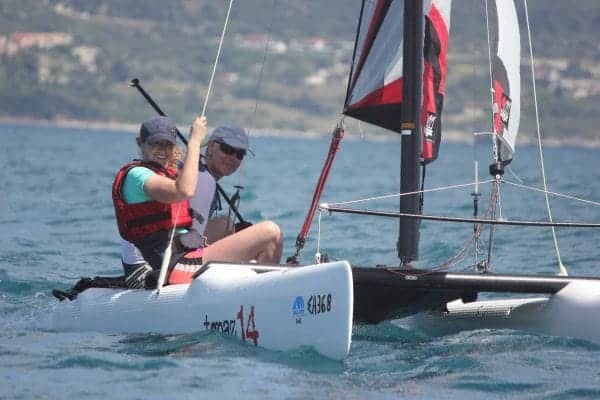 These sessions are condition dependent and cover rigging the cat, parts of the boat, ways of improving your overall technique and how to sail faster. Already an experienced dinghy sailor? We offer advanced clinics, including using the trapeze, managing waves and handling the Cat in stronger winds. Our instructors need the right conditions to teach these techniques effectively, so sessions are planned around the wind and daily forecast. Whether you’re completely new to sailing or a seasoned pro, private tuition will help you to progress quickly. Sessions are tailored to your needs and are booked in-resort. Private lessons are charged by the hour with a maximum group size of 3 students to 1 instructor (£25 per person). To book tuition, please speak to your club manager or senior instructor on the beach when you are out in Kefalonia. Private tuition CANNOT be booked in advance of your holiday. Availability is dependent on day to day beach operations. At the end of the week it’s race day time. All sailing abilities are welcome to take part in one of our regattas at both Lixouri Bay and Paliki Beach Clubs. We operate a simple handy-cap system that allows a fair race for all participants, no matter what boat you choose. Come along to the safety brief, grab a boat and enjoy a fun afternoon racing around buoys. It’s all very informal and always ends with a few beers in the beach bar. All our boats and equipment are kept in tip-top condition throughout the season. Regular kit reviews ensure we provide you with the best kit available. We are delighted to be able to offer two types of catamaran for our guests for this season. 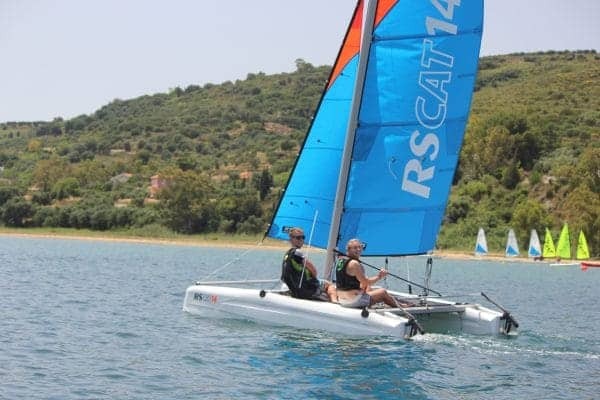 3x RS CAT 16s available at Lixouri Bay Beach Club. 3x Topaz 14s, X 1 Topaz 16 are available at Paliki Beach Club. Try a yachting holiday with our Learn to Sail holidays!